Revlon offered to send me some false eyelashes to try out, I said sure and they also included some press on nails. I tried on this style called Mystic, it's pretty cute with a colored french tip with dots and some have a little rhinestone in it. 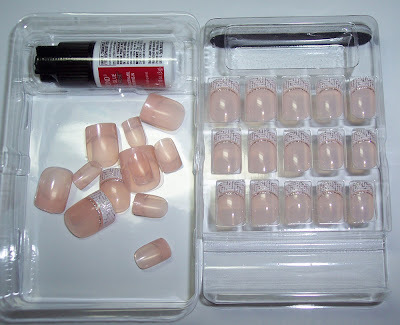 Each kit comes with 24 nails, glue, a cuticle stick and a little file. The glue I found out from my first nail is very very runny! I got it everywhere, I smudged a nail with it and it got all over a couple of fingers on my other hand. I definitely need more practice putting these on, but what I ended up liking was to apply the glue on the fake nail (none on my real nail) and apply. You can see I got air bubbles on all of my nails except my index, that nail actually was way too large so it didn't have an air pocket. You can click to enlarge. The only bummer was that most of these did not fit my tiny nails, even the smallest one was too large for my pinky. They all needed filing except for my ring finger, but I'm terrible at that sort of thing so I put them on as-is. This is not Revlons fault or anything, but if you have small nails like me you may need to do extra filing. 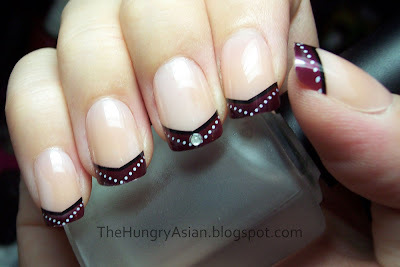 These nails were cute, I like the style and length a lot. You get the hang of putting them on after a few nails, and removal took about 20 minutes. I soaked my fingertips in pure acetone and they just melt off. You can wipe inbetween dips to help remove them. As long as you don't pick or pry them off they do not damage your nails at all. They are available at drugstores and such for around $7 a box. Those press-ons are so cute! Just so you know, I changed the url to my blog and a glitch occured so that no one got updated on it. If you aren't getting my posts (and your blogroll isn't updating my blog), the new url is http://naive-nails.blogspot.com/. You may have to unfollow the old url and follow the new one. I am so sorry about the hassle, it has been such a big mess! Those are very pretty, I like the design a lot. They look quite natural too which is nice. I think maybe they wouldn't fit my nails either because they are quite small. Still cute though! I have yet to try press on nails but those revlon ones look very pretty. What a pretty style. I love these. They really do look like your own nails. I will fix my blogroll, thanks for letting me know! Thanks, I loved the nail party you had with yours! ohh these are so pretty!!! Omg those are *so* cute!